I just finished making a batch of this yummy stuff. My favorite use for it is mixed with cream cheese and spread on crackers as a snack or appetizer, but it’s very versatile. You can warm it and brush on boneless skinless chicken breasts or pork chops while they’re baking. Spread it on a ham, pork or chicken sandwich. Add it to a stir fry for that sweet/sour thing. Mix with mayo for a great topping for a turkey sandwich. And here’s one I found in Chile Pepper Magazine – mix melted butter, bourbon, honey and pepper jelly together and spread over salmon filets, then bake. YUUUMMM. The heat in this recipe never comes out quite the same in any two batches I make, because it’s hard to judge just how hot any batch of peppers are going to be. Use your judgement when selecting peppers. Obviously if you’re going to use Scotch Bonnets or Habaneros you want to go easy. I usually choose mid-range ones such as hot yellow wax. I want the flavor of the peppers to come through, not just the heat. This recipe gives about 4 1/2 pints. Most people use 1/2 pint jars, but we go through it so quickly I used pint jars. The filled jars will need to be processed in a hot water bath. Get a large pot of water deep enough to cover your jars by 1 to 2 inches, and bring to a boil. 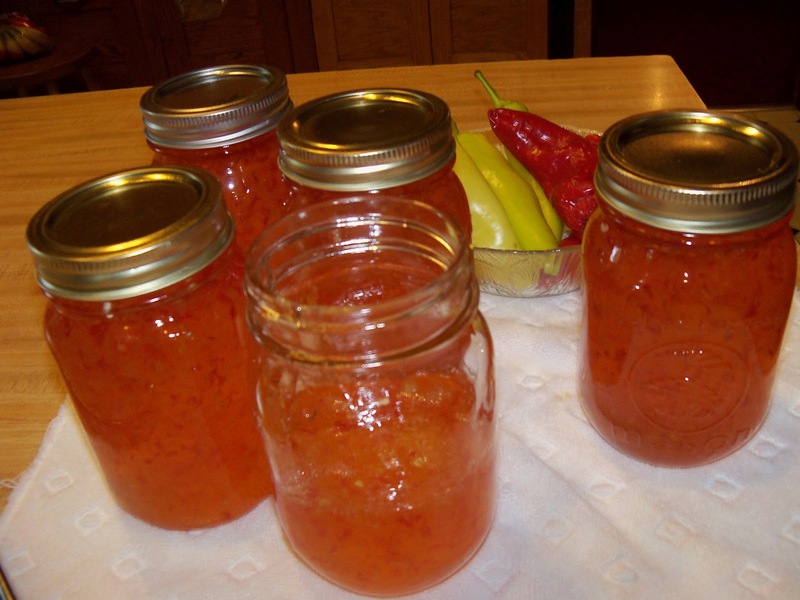 While the jelly is cooking, put your jars in the pot and boil them to sterilize and put in your rubber lids to soften. After jars are filled, screw on preserving lids and gently lower them into the boiling water. Simmer for 5 minutes. Remove and place on a cooling rack or dry towel. The hardest part of this recipe is getting the jars out of the hot water without burning yourself! Prepare your jars and lids. Cut peppers into 1 inch chunks and put in food processor or blender. Chop into very fine pieces. Put into a large pot. Add sugar and vinegar and mix well. Bring to a rolling boil. Turn heat down to medium and continue to simmer for about 5 minutes, stirring occasionally. Remove from heat and mix in pectin. Ladle into jars leaving 1/2 inch headroom. Put on preserving caps and screw tightly. Process in hot water bath as directed above. Remove from hot water and admire!